Kamsahamnida to all big fans of Korean Skincare and beauty products! I'm was introduced to Korean brands during my college days, when Korean Male stars endorsed Makeup - like what?! That's the time I got into Korean products :)) Good Job for Etude House - Effective endorsement! :P Korean BB Creams are my saviour - it made my skin clearer during my teen years. Right now, I introduce you to Althea Korea, offers comprehensive K-beauty selection at the lowest price. I appreciate e-commerce site designed to be responsive to all devices. It also comes with filters: Brand, Category, and Price for easier shopping! Let me tell you more about my experience with this new shopping site. I haven't tried ordering directly from Korea without the online sellers before. Now I can now purchase my orders directly to them. No more waiting 2-3 weeks for my parcel to arrive! I'm satisfied with the delivery, it's not as long as I expect. They're partnered with LBC and CJ Express - I got my parcel via CJ. Basically, Althea Korea offers Free International delivery if your total order would reach ₱1,500 or higher. On their launching month starting February 15, 2016, buyers can get free shipping for every ₱1,000 spent! Althea Korea currently accepts payments via Paypal. I hope they can add more options later. Products are shipped directly from Korea! So who doesn't love to buy products fresh from manufacturers. Wherein in malls, a known makeup brand that starts with M, offered me lipsticks almost a year from the manufacturing date - even tho it's sealed, I declined. From my package: The Face Shop, Nature Republic, and Inissfree got expiry dates till last quarter of 2018! Gong Xi Fa Cai Bellas! Althea Philippines will officially launch by February 15, 2016! So make sure to save the date! ₱300 will be credited to new account sign ups! You can immediately start your shopping! Free shipping for every ₱1,000 during the launching month! Some items in Zero deals! Kick start your K-Beauty obsession and visit http://ph.althea.kr/ now! 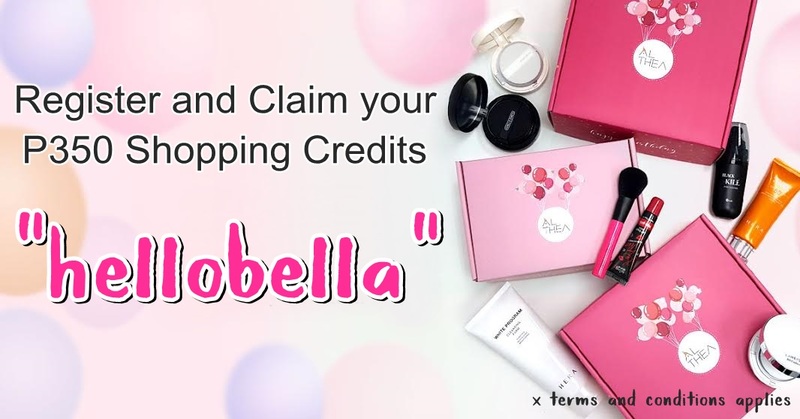 hellobella for a special discount. You’re going to love Althea! Disclaimer: Althea Korea box is sponsored. Credits are provided to purchase these items. 6 comments on "Kick start your Kbeauty obsession with Althea Korea"
Aga dumating nung sayo :( Akin 10 days. Mukhang puro cosmetics sayo ah hehe. Planning to get my batch 2 kasi kulang yung 2k credits hehe. Kulang yung nakuha mo? :( same day lang ba tyo nag check out? I see you stocked up on Drawing Brow. Haha. Nice haul! I notice a lot of us focused on picking out skincare items from Althea.